Miniature, scale 1:6. 16.1 x 10.0 x 4.6 cm [6 3/8 x 3 7/8 x 1 3/4 in. ], edition of 6. Billy is the name of an Ikea bookcase and it is also the title I gave to another work dating from 1995. This new piece is a model of the bookcase in the same scale and level of detail as the miniatures produced by the Vitra Design Museum. Vitra Design Museum miniatures reproduce pieces of furniture, often very famous but produced in limited quantities, by modern and contemporary designers and architects. In contrast, Billy is probably one of the most affordable and most widely sold pieces of furniture in the world, and the designer of this functional, generic bookcase remains anonymous. 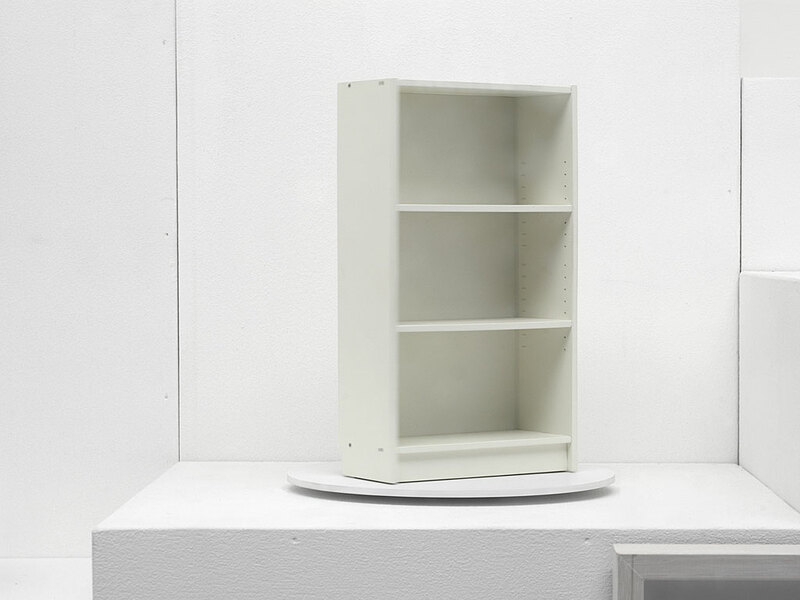 As this limited-edition miniature Billy is much more expensive to produce than the actual bookcase, it creates an inversion of value between the original and its scaled-down reproduction. When exhibited, the miniature is displayed on a small rotating stand.